With Confirmation Of A New Ford Bronco, How Will Chevrolet Respond? The boom of the crossover, truck and SUV segment in the U.S. has a few silver linings for fans of some iconic nameplates. Specifically, it led to the rebirth of the Chevrolet Colorado and GMC Canyon. To counter, Ford will put the Ranger midsize truck back into production in the near future, but the blue oval has something else on the way: an all-new Ford Bronco. According to Ford Authority, the iconic Ford Bronco will once again return and be assembled in Michigan along with a reborn Ford Ranger. While General Motors has the upper hand in the midsize truck segment, Chevrolet has nothing at present to punch back at the Bronco. The Bronco is expected to be a body-on-frame SUV to fill out Ford’s crossover and SUV lineup with a new midsize vehicle. Over at Chevrolet, the brand just finished repositioning the 2018 Equinox as a compact crossover to make room for an all-new midsize crossover, rumored to be called the Blazer. But, while a rumored Blazer may match the Bronco in size, we’ve heard nothing to pin the Blazer as a body-on-frame SUV. Rather, it’s expected the new midsize Chevrolet will ride on the C1XX platform, which underpins the 2017 GMC Acadia and 2017 Cadillac XT5. 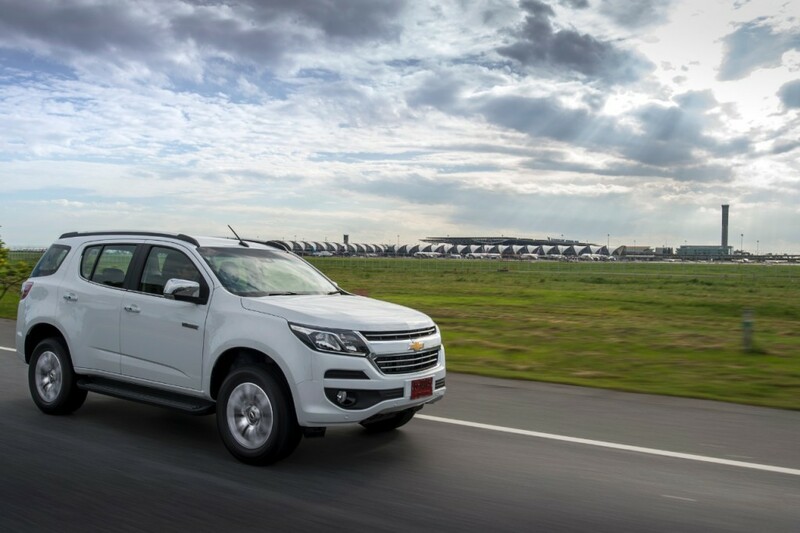 Of course, there’s the Chevrolet Trailblazer sold in global markets, but mum is the word on such an SUV to enter the North American market. With the intel we currently have, it seems the best chance for a true sport utility vehicle to find its way back to General Motors of North America may sit with GMC. After the brand repositioned the 2017 Acadia as a midsize crossover, GM stated it will not vacate the full-size segment. And we know GMC dealers have been itching for a vehicle to properly match hot Jeep Grand Cherokee sales. If GM wants to, they can easily respond with either of the following products. 2. They could resurrect a Hummer type product under the GMC brand based on a Sierra or Canyon. I think GM needs a jeep fighter so either of the above could cover that. Cleary Ford thinks that they need a Jeep fighter too and that’s why they are bringing out the Bronco. I used to be a Ford guy until I bought my first GM product (2010 Camaro) and that changed everything for me. Now my wife and I have only had GMs since then. This Bronco is interesting so we’ll see. My preference would be a GMC “Hummer” type product. I hope the next Bronco does indeed stir Chevrolet to build an all-new, RWD-based SUV! With the Colorado, Chevy has virtually all the essential resources they need to produce the SUV and restore the much-beloved Blazer/Trailblazer nameplate! I just hope they don’t simply ship the current model over as is and call it a day! I want to see Chevy apply all-new exterior and interior styling updates, combined with the current, excellent engine options available! Do you think the market is big enough? Are down votes suggesting the market isn’t big enough? or that you don’t want to answer my question. Yeah I noticed some responses are being met with a considerable amount of down-votes! That’s just the way it is nowadays…. I didn’t down-vote you in case you’re wondering. I guess to answer your question, I would say the market’s insatiable thirst for crossovers and small SUV’s do seem to suggest there’s room in the market for such a SUV to come out of Chevy/GMC. However, as some have pointed out, should we see another spike in gas prices, it could spell the end for these SUV’s. Not to mention the relatively small possibility of a potential Blazer/Trailblazer overlapping the full-sized Tahoe/Yukon. Which is why I wonder how will GM approach marketing these vehicles….. It will probably be on the Ford Everest platform, which is cool because its still body-on-frame. I think we already know where GM is going here. We will see a Colorado/Canyon based SUV model here. Now do not expect what Holden has as like with the trucks they will rehash them for out markets wants and needs. We keep hearing about a Grand Cherokee fighter and a Jeep Wrangler fighter and I expect them to address both with the Chevy and GMC models. The Bronco was no surprise nor was the Ranger. GM shifted all their SUV/CUV models down to place the new model just below the Yukon. Now also do not expect the Bronco to be identical to what is in the photo here. I expect it to be much less car show like and more SUV like. Keep in mind it will be on the Ranger platform too so the size will be similar to the coming Chevy. So there Is no need to stir here as all these vehicles were some of the worst kept secrets in Detroit. We knew they were coming just the details need to be filled in. I still expect these smaller RWD based models to take the 1/2 ton slot in the market in the future and the larger full size will all be 3/4 and one ton models. This is to take advantage of the lower CAFE regulations of the heavier classed vehicles. The Half tons will take a major hit in MPG once 2025 while the 3/4 not as much. Think of the 3/4 models as heavy 1/2 tons. This is why so much attention is being paid to the 3/4 vehicles now. And at this point, we can all agree that not offering a true RWD/4WD SUV to slot under the Tahoe/Yukon in the U.S. market would be a huge mistake by GM. I’m surprised it took this long for automakers to look at the Grand Cherokee and 4Runner to realize there’s still a profitable market for these things, and that a good number of SUV buyers actually want a SUV for more than ride height and cool factor. It was a point of choosing future product that was needed not just wanted. The FWD/AWD is the product that will carry the volume in the future. GM focused on this profit rich segments first. Jeep had the Cherokee by default as that was what Chrysler did before they were sold out. Now Jeep is in a big move to the higher volume higher profit FWD/AWD models. These are based on existing Fiat Products and are where the higher volumes will come as CAFE comes in. GM on the other hand had the Nox and Torrent now Terrain and the larger Acadia and Enclave platform out and Chevy coming so they made use of what they already had since they had no smaller RWD platform in place. Now look at GM and FCA GM is already in place now for the future as FCA is working hard to get out more smaller product to take on the lower cost segments where most of the volume will be. No right or wrong here just two different approaches to the market and GM to this point is doing well with it. No company can make all the models at one time and they both chose different paths based on their portfolio’s. Both worked from what they had to the middle where they will meet. Ford did pretty much the same thing. They will sit back and wait for the bronco to fail. It’ll be a hit in year 1, but right about year 6, right as its getting redesigned… AXE. I don’t think we have to worry about the pictured Bronco coming to market looking anything like it since it’s 13 years old . Chevy could make a 2 door Tahoe into a Blazer and GMC could follow with a Yukon with 2 doors . Actually GM might still be working on a Grand Cherokee fighter because the Acadia and Traverse are not true off road vehicles . Just putting an ” All Terrain ” badge on the new Acadia won’t live up to being anything but a light off road vehicle as the worst these CUV’s will ever see is a good snow driver . They are not trucks ( SUV’s ) but smaller mini-vans if you want the real truth . Although I like the new Acadia I cringe anytime someone compares it to the Ford Explorer ( although they do look abit similar ) but thats the extent of it . GM already knows about Ford’s plans and they may just take a wait and see approach . The blazer will be here in 2018 as a SUV. This is nothing new people, it will be on these same BOF chassis as these Colorado and these canyon pickup trucks. Gm is not waiting. 2017 or 2018 model year, on of them but it is coming. Blazer is in the works for SOP late 2018/early 2019. It will be on the C1XX platform, the same as Acadia (4 door, 3 row seating) SUV. No word if Ford will make a 2 or 4 door bronco. Looks like focus is on competing with Jeep. You right fordan, the Blazer SUV will be on( C1xx mid-size) chassis. GMC will be more focus on competing with jeep, as in jeep wranger . GM may never offer a truck akin to a BOF Bronco, they could, but it doesn’t mean they will. GM has had plenty of time/opportunity to offer a competitor to the Raptor and they have done nothing. So often Reuss and Co. use the excuse of ……”not sure we can make any money?” The Raptor makes Ford and it’s dealers plenty of $$$, the same would be true if GM offered one, but they don’t. Some will say……wait for the ZR2 Colorado! Fact is, It’s not in the same class, although the way GM prices things these days it could approach the base price of a Raptor ($49,520). Does the Jeep grand Cherokee have a unitized frame? I know it was engineered by Mercedes, before their breakup. While I’d love for this to revive the K5 Blazer, I think it’s better to make a GMC off-roader and two in one Bronco and Wrangler fighter. Well that funny because I heard that the ford bronco would not be on a BOF chassis. Well here are some things we can all look for. #1 the Bronco is not going to look like what is in the Photo. That is a show vehicle. #2 I expect it to be on the Ranger chassis. #3 Even if they do BOF or Unibody it will be ok either way as we have models on both and both do very well. #4 I expect the primary model to be a 5 door but I would not be shocked with a 3 door showing up with it. #5 It will be a V6 and 4 cylinder model. #6 GM has a RWd /4×4 version of their own coming. Their priority has been to get the Colorado and Canyon up first. #7 The Ranger is on the way too. #8 Do not expect a 2 door Tahoe. It will remain a 5 door and may get a higher weight rating of 3/4 for the base model once CAFE goes up. #9 We may see a more Hummer like version for GMC while Chevy stays a little more like the Colorado. #10 Expect some changes from the Holden version. The real question is how will these impact Tahoe and Yukon sales? Lower prices and better MPG will give them an upper hand with customers on the now already way over priced larger models. GM will want to sell less larger SUV models in the future and at a higher price. MPG numbers are really tough on 1/2 ton models and while they do not want to stop making them they may have to limit their volumes. At one point a GM truck designer said they had considered killing the Tahoe at one point as one path they may have to choose. I know they do not want to do that but they have to find ways to make it fit their product plans and regulations. GM will have plenty of time to decide as the Bronco will not arrive until 2020. The Ranger will not arrive until 2018. Trucks may be out of demand by that time. You are going to take the word of a UAW Rep that the Bronco is coming out? He is just as informed on what Ford is planning as we all are, which is none. Yes the ranger is coming back and Ford has confirmed that but the rep has no idea what he saying when it comes to Ford’s future. His business is with the union at the plant, not at the Ford design center. Is Chevrolet even allowed to respond?? I’m being sincere here. This isn’t racing related… I’m pretty convinced that GM has designated Buick/GMC as Ford’s direct competitors if it’s not racetrack competition. The old Chevrolet matching or besting Ford thing hasn’t been a reality in years. Chevrolet’s lack of AWD, platinum/titanium trims, true sport models, V6’s etc.. is very telling. I’ll also add that the gmt400/800 Tahoe was in reality the K5 Blazer successor. It was the CK/Silverado truck in suv form (aka fixed topper with extra seating). It wasn’t until GM decided to separate the Silverado from the Tahoe that this changed. I’d argue for the worse.. The trucks got monster sized and somewhat odd looking while the Tahoe remained regular old school truck sized and retained classic good looks. But what made the K5 Blazer a successful Bronco fighter was that the CK/Silverado 4×4’s had solid front axles. GM hasn’t had that in over 25 years nor do I see it ever returning sadly. I think the ZR2 Colorado and the rumored upcoming Trailblazer (hopefully they’ll just name it Blazer again) based off the Colorado platform is the best we may get. If the ZR2 is set up to even be a 60% Raptor fighter, basing a Blazer off that may work just fine. This is again assuming Chevrolet is allowed.